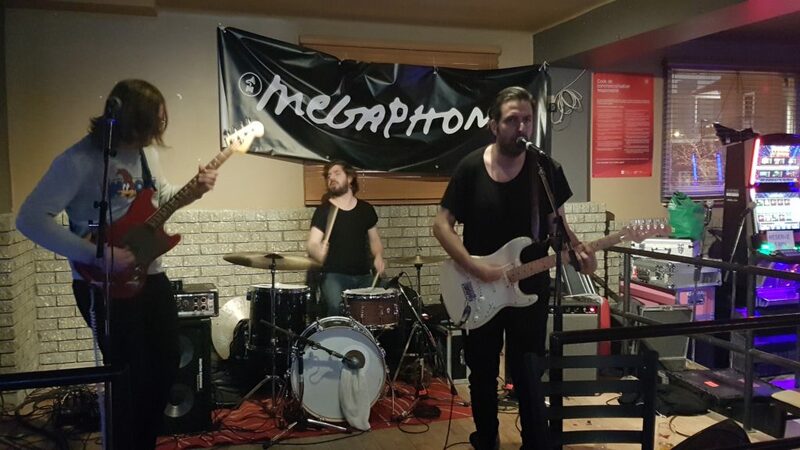 The first night of the Megaphono festival which showcases a warmth of talent in town during one of the coldest times of the year, took me across the bridge to Hull to see a trio of Quebecois acts at Brasserie de l’ile. Before I can get into speaking about the bands and the show, I would be remiss not to mention that this is the bar I was taken to during frosh week at the University of Ottawa around 10 years earlier. They had promised us that we were going to the nicest club in the Gatineau region following a few hours at the casino. Well after driving around in what appeared to be circles for almost an hour, we were dropped off at Brasserie de l’ile, which at the time had cardboard in one of the windows due to it being broken, was dimly lit, kind of grungy, had $10 pitchers of beer and a tiny little stage with a punk rock band playing whose guitarist was sporting one of the biggest mohawks I had ever seen. Some would have called it a dive, I prefer to think of it as a very local-centric bar with character and history. Either way, I was so very pleased that we were there and not at a fancy club, but not all my suit wearing and cocktail dress laden classmates shared my enthusiasm. Krief closing out the first night of Megaphono 2019 at Brasserie de l’ile in Hull. So with that in mind, you could imagine my excitement and intrigue when I saw that Megaphono was hosting a show there. The place seemed much nicer than memory, with better lighting and a much larger and better equipped stage, but it still had electronic slot machines for flavour. Headlining the night was Krief, who many may better know as Patrick Krief, former guitarist of Canadian indie-rock band The Dears. The music was extremely rich for a three-piece and while Krief’s time with The Dears can certainly be heard and felt in the songs, it also feels like he is breaking free of his old mold and preparing to move on. The single “Daydream Lover” off of his most recent EP Line Stepper is a must listen and had my favourite lyrics of the night. He sings “I was meant to be a runner but my legs got tired, Release me from the ash of a fire that I once loved ” and later on “I was supposed to be a lover but my hands got tied.” His deep voice setting up those lines through his ambient guitar just really resonated with me. I also loved the facial expressions he made when he really laid into his guitar. The man really gets into it. 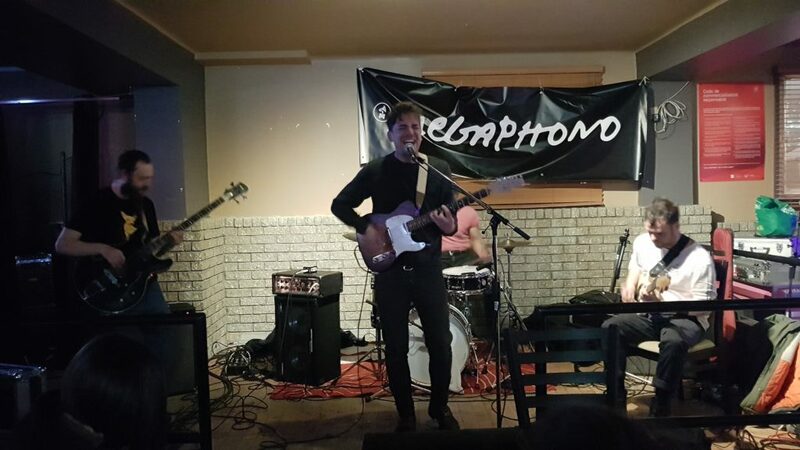 Louis-Philippe Robillard performing at Brasserie de l’ile in Hull during Megaphono 2019. The middle act was a very familiar face to me and many others in the crowd even if he had traveled in from Montreal to perform. Louis-Philippe Robillard and I went to high school together at De La Salle in Ottawa, and a good group of our classmates showed up. Many others may have recognized him if they had been lucky enough to see him previously play as a solo performer or as the front man of the super fun but too short-lived local francophone gypsy folk band Marabou. Marabou played over 100 shows over approximately a one year span around 2009 and 2010. During the time Marabou was wrapping up Louis-Philippe released his multiple-award winning record “Le Café des oiseaux,” but then not too long after took a break shifting his focus on many other things like traveling, making soundtracks, learning woodwork and joining a burlesque troupe. Well-traveled and full of new discoveries, he is finally back on the musical stage performing and poised to release his followup album this year, which we got a taste of Thursday night. The Franco-Ontarian singer-songwriter performs his french folk with a lot of passion and emotion, but also finds time for a little humour and levity. He played one song which he introduced as a true story about a guy who crashed a truck into his garage and set it on fire. Louis-Philippe assumed he was quite a lonely man. After what I heard I cannot wait for the new album. Opening the show was a six-piece act known as The Blaze Velluto Collection. They were a high energy group that at times had the feeling of a 70s psychedlic rock jam band but at other times also made me think of lighter summery folk music a la Edward Sharp and the Magnetic Zeros. They scored major points with me for having a flutist who doubled as a saxophonist, having dueling male-female vocals and a lot of energy. While Velluto was the leader of the group and primary singer, Kathleen Roy’s vocals, which sounded like they had some southern American spice to them, really drew me in. What she may lack in stature she certainly makes up for in stage presence and talent. The set was wonderful and an excellent way to kick off the festival for me. The highlights were the song “Weatherman” which recounts the heartache of a weatherman and their song “We’re Gonna Take You Out” which is all about discussing with your dog about taking them out for a walk so that they can relive themselves…as a dog owner I really saw myself in this piece.